The Chow Non-Stick Cookset is like using your home cooking utensils whilst camping the high quality non-stick interior surfaces allow you to cook with the confidence you will not burn whatever it is you’re preparing. This product is ideal for families, couples and small groups. Each item has a sturdy folding cool touch handle to ensure your safety. Each piece is made from strong, lightweight aluminium and is therefore light to carry as well as being easy to clean. 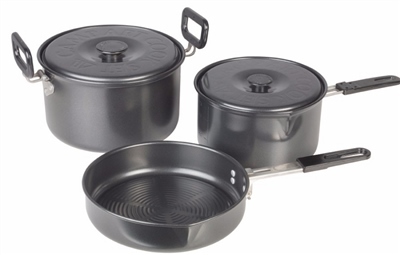 This cookset comes complete with a storage bag for easy transportation and is designed for use on all types of camping and caravan stoves. big enough but compact in nice bag.